Clarinox are proud to announce an exciting Lua scripting addition to the Clarinox debugger, ClariFi, that supports the verified and fully functional version of ClarinoxBlue Bluetooth Host subsystem and ClarinoxWiFi WLAN protocol stack working with all Clarinox supported platforms. ClariFi reduces the frustration of embedded engineers caused by tedious debugging cycles. It enables fast and efficient analysis of complex applications and problems. In doing so lowering the cost of development significantly. ClariFi enables superior visibility of the communications and results in speedy debugging during the development and assists with ongoing interoperability management after deployment. Our newly added Lua scripting feature opens up even greater debug power and flexibility ensuring fast and efficient debugging of even those hard to find issues. ClariFi gives flexibility in connection interface and can be connected to the target board via UART, Ethernet, JTAG or SPI to capture debug information, protocol packets and much more. Clarinox supply much more that software licenses, including debug tools, sample applications, training sessions, engineering services, software maintenance and technical support throughout our customer entire product lifecycle. Bluetooth has been a part of the Clarinox story for the past 17 years. In the early days the most often asked questions was “What is Bluetooth?” Over the years we’ve moved a long way from there! Bluetooth is now one of the world’s best known technology brand names. Clarinox demonstrated the Clarinox Bluetooth Low Energy Mesh and the Clarinox Debugger capabilities earlier this year at Embedded World in Nurnberg, Germany and were overwhelmed by the response. The growing complexity of use cases drives up the interest in, and usefulness of, the award winning Clarinox Debugger. Clarinox®, a leading provider of embedded Bluetooth® and Wi-Fi® protocol stack software, is pleased to announce signing ITEC Ltd. as the Reselling Partner for Clarinox® within Israel for its complete product portfolio, including ClarinoxWiFi™ WLAN Protocol Stack; ClarinoxBlue™ BT/BLE Protocol Stack; Clarinox® Debugger/Protocol Analyzer™; Koala® EVM, Joeyduino™ Wireless Module development platform, and the small form factor hardware modules Koala Connect® / Yulo Connect™. ClarinoxWiFi™, ClarinoxBlue™ Bluetooth® Classic, ClarinoxBlue™ Bluetooth® Low Energy (BLE) including BLE MESH protocol Stacks, help to significantly shrink the development cycle of embedded wireless systems. The support for both separate or simultaneous running of different roles & profiles, across a wide selection of OS/RTOS, MCU/MPU and radio chipsets, provides agility for companies building wireless embedded development. The robust and secure protocol stacks are widely adapted by companies of different size, from Fortune 100 to startups, in various markets like automotive, industrial, health / medical, home automation, consumer electronics, office automation, defence and others, across the globe. Clarinox Technologies provides industry leading solutions for protocol stack software for Bluetooth® Classic, Bluetooth® Low Energy and Wi-Fi® for a large range of RTOS/OS and MCU/MPU platforms. Clarinox® solutions address the inherent complexity of wireless and enhance the productivity of engineers. Itec Ltd. is a leading provider of tools and services to the Israeli Hi-Tech embedded development market. Being in this demanding field for over 30 years we have established excellent contacts and gained invaluable technical experience. Through our highly technical, marketing sales and support team, and based on the collaboration with renowned vendors, we provide best of line offerings to our vast customer base, ranging from Government organizations, through leading hi-tech companies and up to many start-ups. We focus mainly on high-end mission critical applications, where the best tools are required for safety and security, in the fields of Avionics, Medical, Military, Chip design and Automotive. 1 The Bluetooth Special Interest Group (SIG) owns the Bluetooth word mark, figure mark and combination mark (collectively, the Bluetooth trademarks); Wi-Fi is a trademark of the Wi-Fi Alliance; other trademarks listed in this document are owned by Clarinox. Trying to determine how to best implement on a product brief that includes Bluetooth Classic, BLE, Mesh and/or Wi-Fi? Visit Clarinox at Embedded World 2018 for a discussion on how our software stacks, EVMs, modules and debug tools can help you. The release of the Bluetooth Mesh delivers on the promise to utilise the mesh topology within the Bluetooth technology specification to overcome range limitations and hence enabling Bluetooth to cater to a large number of IoT and Industry 4.0 applications such as home, building or factory automation and asset tracking. Naturally, the Clarinox implementation of Bluetooth Mesh leverages the innovative Clarinox Debugger giving developers the visibility to "see through" the issues and accelerate the process of debugging Mesh (and/or other wireless) applications. Quicker debugging translates to faster time to market and the flow-on effects of greater market share and return on investment. Clarinox has the most robust, secure and comprehensive protocol stack software for Wi-Fi, Bluetooth and BLE including Mesh. We have an elite group of subject matter experts to augment our products to give our customers a clear path to a market for their connected products. We can provide BT/BLE/Wi-Fi Connectivity for many different, MCU/MPUs, RTOS/OS and wireless chipsets. 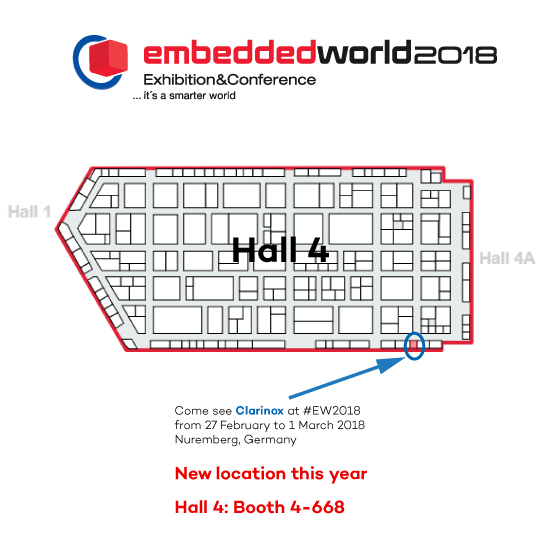 This year at Embedded World we will be showing how to connect devices via BLE Mesh, to this we will add Wi-Fi for connection to the cloud, whilst running the Clarinox Debugger to collect the information needed to make the development of custom use cases fast and fun. Hope to see you at Embedded World!